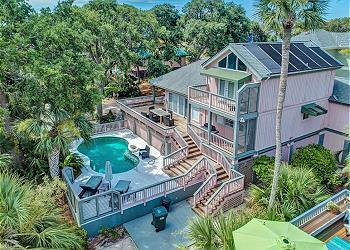 Adorable 4 bedroom, 3.5 bath North Forest Beach home with private *heated pool is the perfect vacation getaway! A hop, skip, and a jump to the beach and across the street from Coligny Plaza. This house is wonderfully decorated in bright, beachy colors with hardwood floors. The main living area, dining room, and kitchen are perfect for family enjoyment. The 1st bedroom has king bedding and a private bathroom. The 2nd bedroom has queen bedding and a private bathroom. The 3rd bedroom king bedding and shares a full bathroom with the 4th bedroom that has 2 Twins. Outside is an excellent pool area with a 1/2 bathroom for your use. 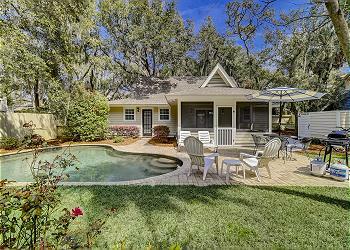 Nearby to this home is Coligny Plaza with shopping, dining, and entertainment every night in the summer. •	Private *heated pool (12 x 24) *This pool has a gas heater and can be heated for an additional fee of $575-$875 + tax per week depending on the season.